Many beautiful and multi-purpose hand crafted baskets by Mary Carty are available for purchase in the shop. All hand-woven baskets are dated and signed by the artist. 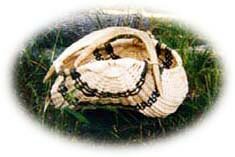 Although Mary weaves both traditional and contemporary baskets, many of her antler baskets have gone beyond contemporary technique and are considered works of art. 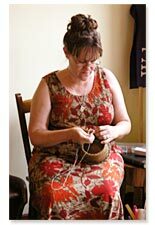 A talented basket weaver, she has won numerous ribbons and awards for her original basket designs. Mary is always experimenting with new shapes and different materials to create useful art in the form of baskets. Always willing to share her knowledge, Mary teaches classes in making antler baskets, too. Mary is a descendant of the original Native American inhabitants of the area, the Piney-Lenape, and brings her Native American heritage into play with her handmade baskets, as well as in her basketry classes and bulk supplies. Is there a particular type of basket you are looking for but cannot find? Did you see a basket on vacation and now regret passing up the opportunity to own it? Bring in a picture and any information you have, and we will do our very best to locate the artist — or to duplicate the basket for you ourselves. Mary loves sharing her knowledge as a teacher, and holds both beginners and specialty classes in basket weaving.